Montauk Highway (27A) is a highway that extends from Jamaica, in the Queens Borough to Montauk Point in Suffolk County, Long Island, New York. It was routed in a southeasterly direction toward the Atlantic Ocean coastline of Long Island, turning in an east-northeasterly direction in current Nassau County to more or less parallel the shore through Suffolk County ending in Montauk, the easternmost city on the South Fork of the island. Montauk Highway is the southernmost east/west route in Suffolk County. In Oakdale, it meets Sunrise Highway (NY 27) and NY 27A ends. From this point east, Montauk Highway is selected CR 85 and CR 80. Before 1972, the NY 27A designation extended east along Montauk Highway to Southampton. The highway was the original route of New York State Route 27, until outmoded for most of its length by Sunrise Highway; much is now Route 27A. Although, there had been relocation made in some places but the original route designated by Old Montauk Highway, notably west of Montauk, where new Montauk Highway still passes through Montauk State Park while the Old Montauk Highway is a narrow hilly road next to the shoreline. Montauk is considered a safe road for motorists that have rarely been breached by even serious storms, although portions were flooded out by the New England Hurricane of 1938 in the Hamptons. It runs roughly a mile to the south of NY 27 for most of its length. Montauk Highway was named after NY 27A’s eastern terminus at NY 27 in Oakdale. The interchange between NY 27 and NY 27A at this point is dubbed the “Oakdale Merge”, and is known as a bottleneck for local traffic. 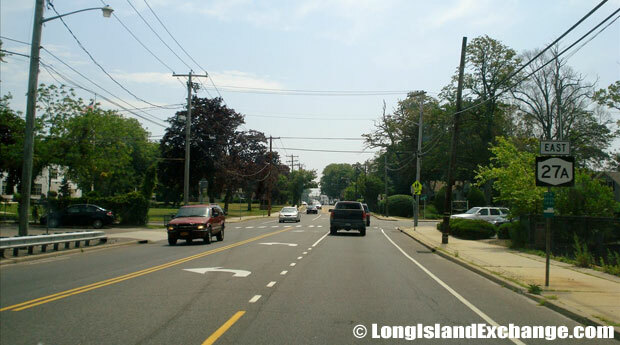 A separate two-lane roadway was constructed to carry Montauk Highway traffic, while Sunrise Highway was expanded to three lanes in each direction. Congestion had been also a problem here due to the lack of service roads through the Oakdale Merge. Montauk Highway is one of the most prominent components in New York State Route 27. 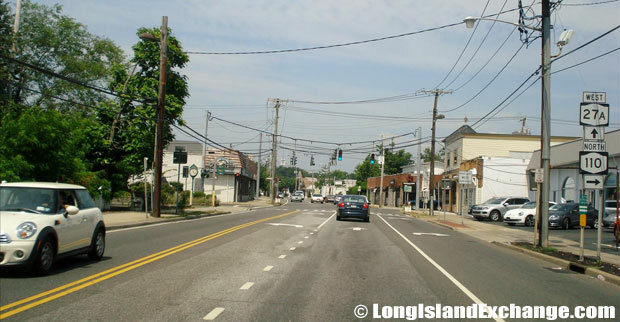 Montauk Highway is often called Main Street in communities such as Amityville, Babylon Village, Bay Shore, Islip, Oakdale, Sayville, and Patchogue, although old-timers in the more westerly communities also call it Merrick Road, though it is not signed that way. The highway is also known as South Country Road. East of Heckscher State Parkway, NY 27A is lined with parkway style lampposts. 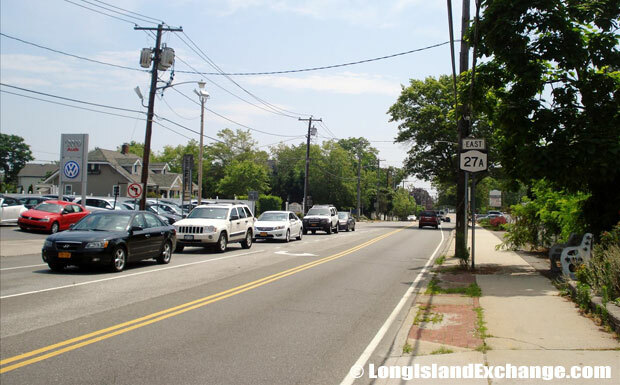 Montauk Highway resumes being New York Route 27 as the major (sometimes only) through road in the area, passing through East Hampton, Amagansett, and Montauk. 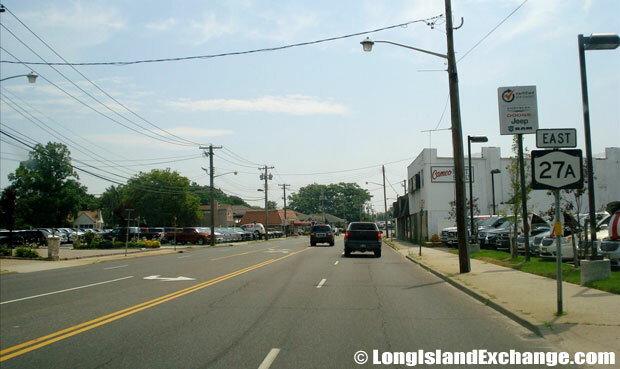 Towards the eastern end of Long Island, Montauk Highway gets very congested in the summer months due mostly to it being primarily a two lane road way which holds all traffic in and out of Long Island’s busy Hamptons seen. If traveling to the Hamptons by car in the spring and summer months, be sure to expect some delays on Montauk Highway. At times, bumper to bumper traffic at almost a standstill is not un-common in the busy season.